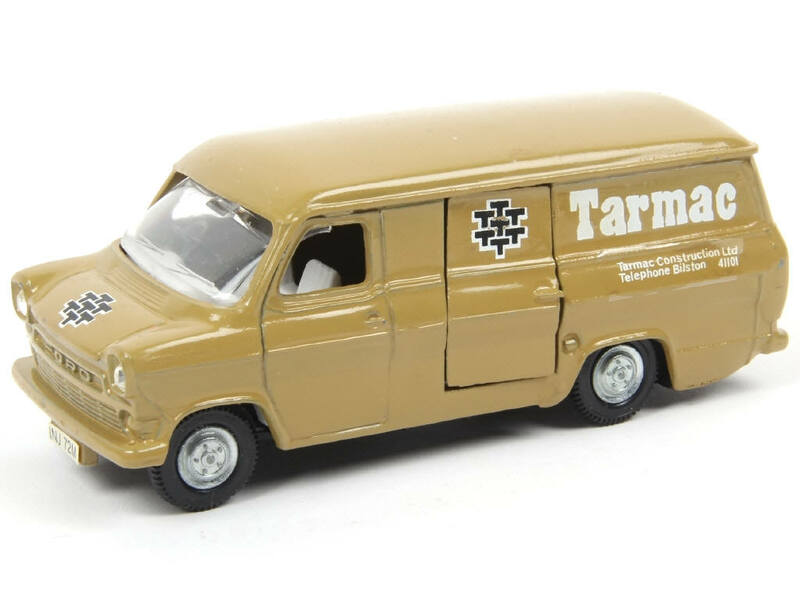 Has anyone come across a 416 Ford Transit van in beige, bearing "Tarmac" decals? I don't think that the John Gay Code 2 range extended to a 416 van, so this model could be someone's Code 3 effort. However, if someone else has seen one before I'd appreciate hearing about it. Back in the late 1980's I stripped and repainted three "Motorway Services" Transit vans into authentic Tarmac livery for a friend who had worked for the company. They were all the earlier-style Mk1 bonnet type, but with only an opening side-loading door and lift-up tailgate. They all had the orange roof beacon. The cast wheels were silver with five wheelnuts and hub details. The colour was actual Tarmac-specification paint, more of an olive-green than beige. The transfers were the then-current typeface and multiple "T" symbols in black and white, available commercially at the time, perhaps from Kingfisher models. My friend passed away just over two years ago, and I know that the family disposed of his model collection to a dealer - maybe you have one of these. I did not take any photographs at the time, but remember painting the interior mouldings matt dark grey. I think John Gay had done the 410 Bedford van in a similar livery a few years earlier. Hi Richard, same casting and a very similar job, but the ones I did had silver bumpers and grille, and they had orange roof beacons. I think those are the same transfers that I used. The paint may have been a little darker on mine, and I had painted the interiors a darker shade of grey too.